That fills the Valley and renews the Earth. You may see my teacher, Master Dong, do this simple set of moves while at workshops, over and over again when he is alone. I have often wondered what is his meditation, what he is up to? Obviously he is meditating, the form is expressed so beautifully when you can softly walk through these simple meditative routines. I have been copying him and a had a break-through today in training. The Book of Changes, “I Ching” follows the changes of Heaven and Earth through symbolism. Yin/Yang is expressed in folding, rolling patterns that, like the DNA molecule, make a double helix woven tapestry expressing the changes of life. The eight changes represent different energies. Heaven and Earth, Water and Fire, Mountain and Valley, Wind and Thunder, are the changes of Tao. You can do this simple routine over and over on both sides continuously. Never stop practicing, though many things can get in your Way. Being part of the Way, to be a Wayfarer, is that we never stop practicing; we cannot stop, life is a river of change. Our workshop was fantastic! Thanks to Gerri Nishida for making it all possible. Aloha, and Happy New Year. 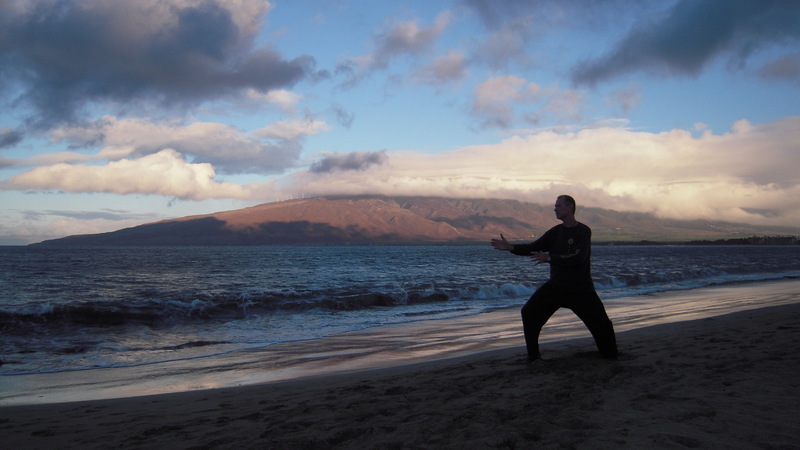 We are also announcing a new Yang Style Sword class on Thursday mornings in Haiku. Click on the photos to see larger images, Thank you to Phil Sabado, Pam Kesler, and Wanda Russell for the photos. Beautiful sunset view… Kula park is fantastic! All New! Every Sunday afternoon at Kula Park. This class is learning the Dong (Yang) Style Long Form and meets for one and a half hours. 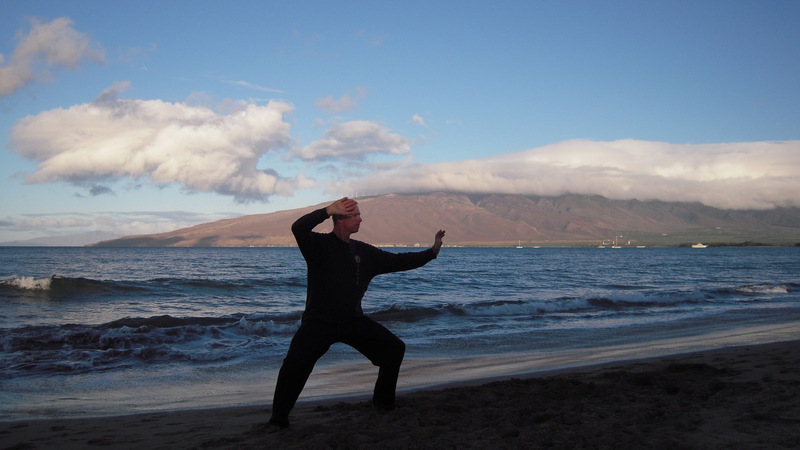 As always, every class starts with wuji and qigong, but this class lasts a little longer and is very relaxed. Since we are starting out new, beginners are very welcome, yet with the extra time, experienced players will also enjoy this class. The park is just past the Kula fire station; see the map here. 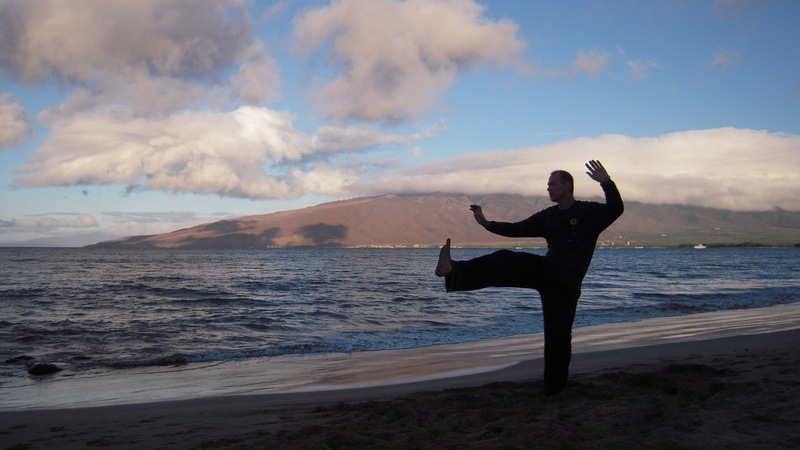 Master Dong’s workshop in Kula is one month away! Don’t miss another chance to train with my teacher! Grandmaster Dong is a living legend, come and support him and our lineage and receive the best Taiji training you can get. KULA COMMUNITY CENTER 9:00 a.m -11:30 a.m. Lunch is provided on Saturday and Sunday for those participating in the entire workshop. Dinner will be catered on Saturday evening (Catered dinner -additional fee) We will provide water on all 3 days. 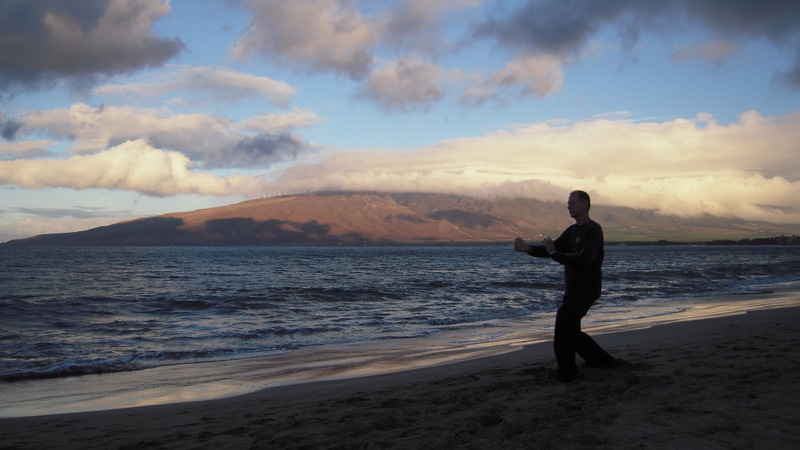 A 2.5 hour break is scheduled on Saturday for participants to enjoy a drive down to the beach, sight see in the upcountry area ( lavender farm, winery, Haleakala), pick up Maui items to take home, enjoy a massage or just relax. I hope to see you there! Call Joy (808 573-8384) to get the address to mail in your checks. Here is a written description of how to perform the Dong Family warmups and qigong set. Italicized comments are from Cory Williams. I call this “The Basic Set” and it is the first thing I show all of my students. Shifu Dong told me once; that his grandfather did the “Hard Qigong” set, and his father created the Taiji Gong, “Tiger Mountain” (both sets are still part of our training ) and he created this set I think of as the, “Dong Family Basic Qigong Set.” These are the three basic standing qigong sets , but we all started with this one! Hat tip to Chip Ellis for transcribing all of this. 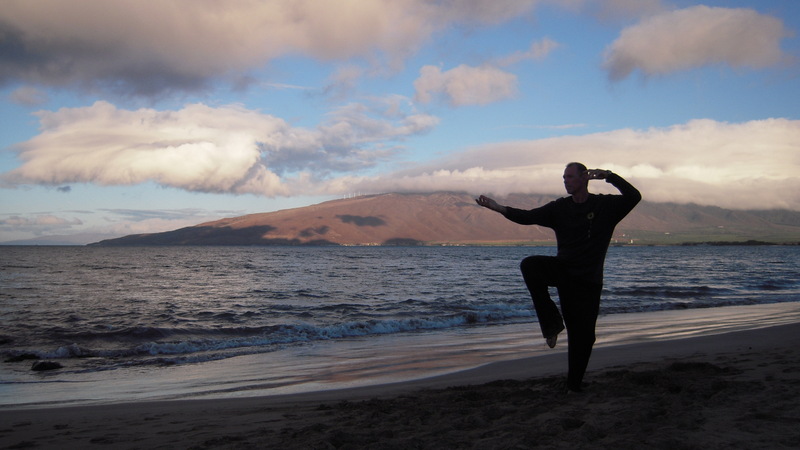 Below is a description of the warm up and qigong routines that are part of the Dong family practice as portrayed in the March 19-21, 2004 seminar in Monterey, California. First salute, step up and position yourself in Wuji stance. Most movements take place while you are standing in an upright position with your feet about shoulder width apart. Body is relaxed, and movement is fluid. 1. Arm Swing – (Master Dong told me this is called “Awakening the Qi”) – Raise both hands overhead, shoulder width apart. Using your body motion, swing your hands down while bending your legs so that your body assumes a squatting position. Using your body, swing your arms up over your head again and repeat. 2. Left / Right Arm Swing – (We always called this movement the “Chinese Drum”) – While in a standing position with feet about shoulder width apart, use your body / waist to swing your arms from left to right at about waist level. Use a relaxed motion. Your arms should move with a whip like action. 3. Left / Right Arm Swing with Shoulder Touch – Continuing the arm swing above, increase the force of the body movement and direct your hand to the opposite shoulder. In other words, swing and tap your shoulder area. 4. Head Rotation – Stand upright and swing your head through a circle – down in front, toward the right shoulder, up and backward, and toward the left shoulder. Repeat several times, then reverse the direction so that you start by going toward the left shoulder. 5. Shoulder Rotation – Stand upright and rotate both shoulders up, forward, down, and back. Repeat a few times then reverse. Note that when you move your shoulders back you should be “pinching” your shoulder blades (slightly) together. 6. Waist Rotation – Standing upright, place your hands on each side of the small of your back. Move your hips to the right, back, left, and forward. Repeat a few times. (15 to 20 reps) While you move your hips, keep your head stationary above your feet. Reverse by moving your hips to the left, back, right and forward. 7. Knee Rotation – Assume a squatting position. Place your hands on your knees, then rotate your knees so that they move in toward the center, back, outward, and forward. Repeat a few times. Then reverse the direction so that your knees start by moving outward instead of inward. This completes the physical warm up movements. 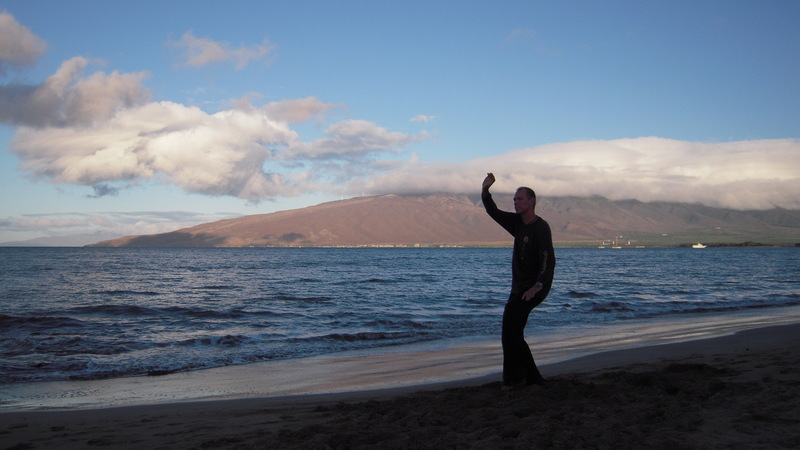 Next is the warm up qigong. 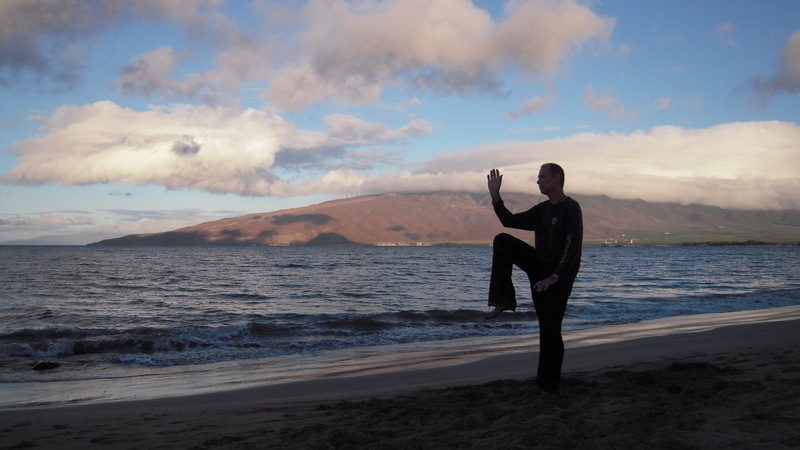 Move smoothly from the knee rotation to the first qigong movement by moving your hands slowly up from your knees and into the first movement. With all these movements you are moving your energy throughout your body. The movement goes in concert with your physical movements – hands up / chi up, hands down / chi down, etc. The energy movement is too complicated to describe here – work with someone who knows the exercises. 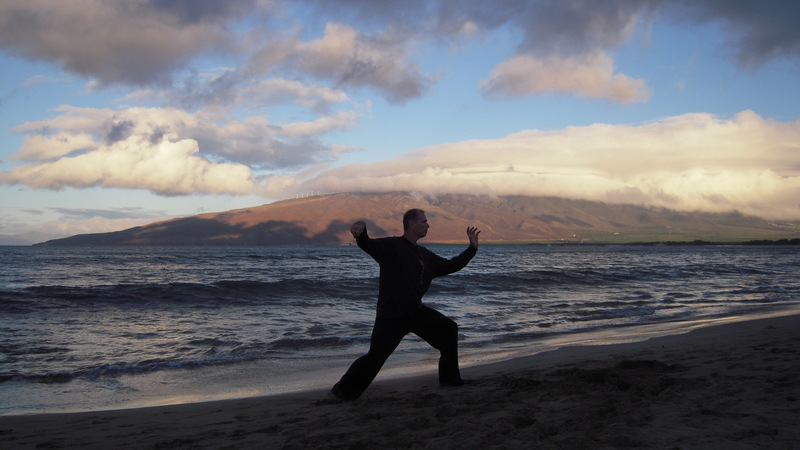 (Read “Tuning the Breath”, Qigong Attitude” and the qigong lessons on this site.) The description below is just a memory aid. The names or the moves are from Dong Zeng Chen by way of Janet Bond. 1. 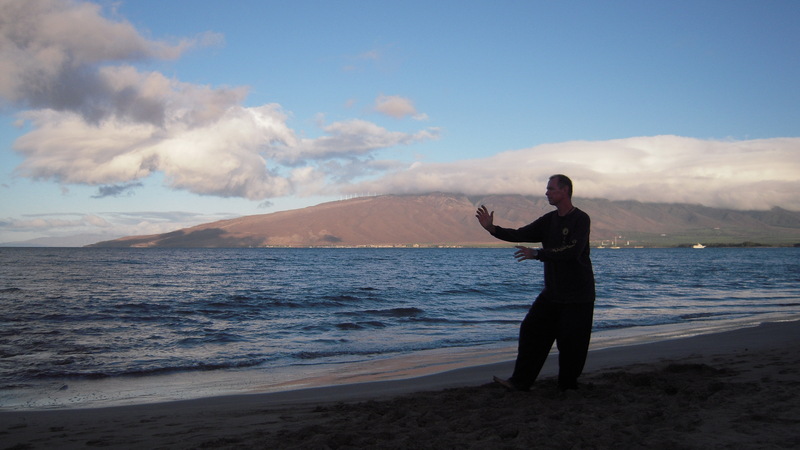 Up / Down – Qi Shi Tiao Xi – (Master Dong told me this is called “Floating Hands”) – This exercise involves moving the hands and arms up and down in an ever larger range of movement. a. Starting from the knee rotation exercise, move your hands up your thighs while you straighten your legs, so that your legs are straight and your hands are at chest level. b. Bend your legs and move your hands down toward the ground and slightly behind your legs. Keep your hands at about shoulder width. again. Then up above your head. Then down. Then up so that you stretch your arms up and your heals lift off the ground. The feeling is like someone is pulling you up by the wrists. 2. Open / Close – Ying Yang Jiao Ti – (Master Dong told me this is called “Exchanging Yin and Yang Energy”) – Separate your feet to slightly wider than your shoulders and point your toes inward slightly. what you would use to grab up a big armful of hay off the floor. b. After your hands grab the “hay” and come together, bend your legs and move your hands up the center line of your body. Palms are facing upward, one over the other. downward at that point. Stretch upward. d. Then separate your hands and bend your fingers so that they point toward the center of the top of your head. As you bring your hands down feel like you are compressing the energy between your finger tips and your head. Move your fingers so they almost touch your head. e. Then open your arms and lean backward, head facing upward. The movement is like a flower opening. fingers point up, energy in your palms. That completes one cycle. 3. Small Circle of Energy – Xiao Zhou Tian – (“Small Circle”) – This is simple circular movement oriented toward the front. a. Start in a standing position with feet about shoulder width apart. palms facing in toward your body. center-line, then down the inside of your legs. d. Continue the circular movement as you straighten your body and bring your hands up and around like you are gathering in energy all around you. e. Hands go up over your head and then back to the starting position. 4. Big Circle of Energy – Da Shou Tian – (“Large Circle”) – Start the same as the small circle of energy above. b. Then move your hands in a circular fashion toward the outside and behind your heels. c. Then up the backs of your legs, while your body is bent over, with the backs of your hands almost touching your body. toward the front by your belly. f. Moving upward your palms change position so that they touch, like you are praying, above and behind your head. forward over your head and down your face to the starting position. 5. Mix of Internal and External Energy – Hun Yuan He Yi – (Master Dong told me this one is called “Gathering Outside Qi”) – This one is like doing giant circles with both hands from right to left and from top to bottom. a. Start in an upright position with feet at about shoulder width. top, to right. Once you loosen up you can use your waist movement to swing your arms around. 6. Opening and Gathering of Chi – Yi Qi Kai He – (Master Dong called this one “Open and Close”) Start in a standing position with feet about shoulder width apart. a. Open your arms wide, with bended arms. you gather in your chi. c. Then bring your hands up the center-line of your body to your chest. Repeat the cycle a few times. c. Move your right arm rearward in a circle while your left arm remains toward the front. d. In a circular movement bring your right hand near your right ear. base of your spine. Stretch. Your eyes first follow your right hand. g. Then in a circular motion bring your left hand to your left ear. Your right hand is toward the front and turns palm up. h. Then move your left hand forward and your right hand toward the rear, in opposite motion. i. With right palm up continue to move your right arm rearward in a circle and repeat the movement. 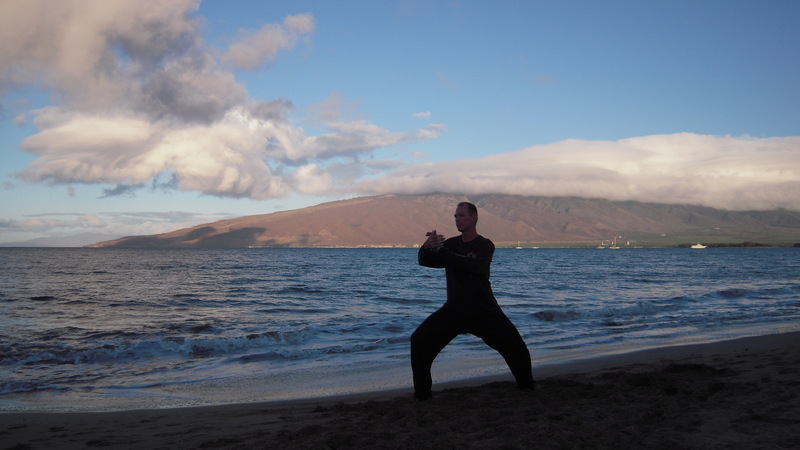 To change to the other side move like you would while you are doing the Taijiquan set to transition from brush left knee to brush right knee. 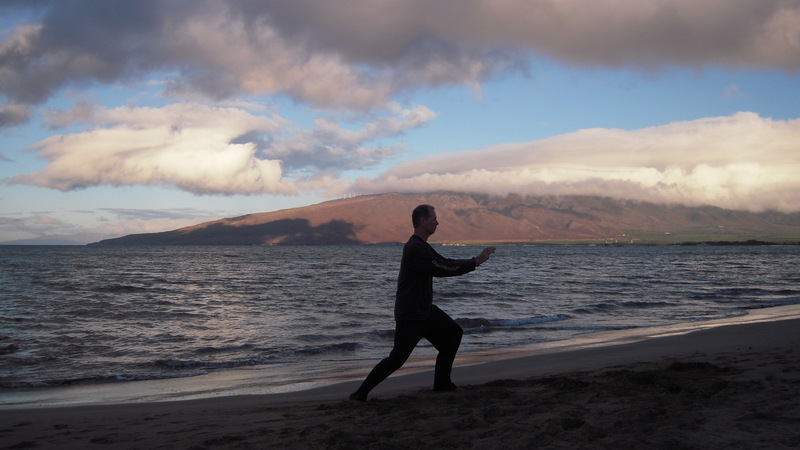 Then repeat the qigong movement on the other side – mirror image.